Dr MacDiarmid, as he was known to everyone at PihaÂ in the 1950s, wasÂ the resident doctor, whether he liked it or not. He came to Piha for the quiet life, to retire, but found himself called on to attend to ailing locals, lifesavers with bleeding heads and drowned visitors, at all times of the day or night. He was born Gordon Napier MacDiarmid at Napier onÂ 17 DecemberÂ 1888. His parents were Neil Kerr MacDiarmid and Mary Emily, born Johnston. 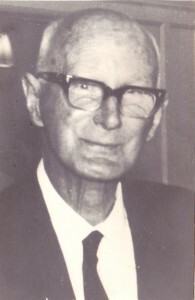 His fatherÂ became aÂ bank manager in New Plymouth and chair of the board of governors of New Plymouth Boys’ High School, so when Gordon went up to receiveÂ his prizes at prizegiving, it was sometimes his father handing them out. He excelled at science and maths, and in the sporting field, gymnastics and sprinting. In 1903 he won the Dr Fookes Challenge Cup for general excellence in and out of school. He passed his medical preliminary examinations in 1904 and in 1906 went to Edinburgh to further his medical studies and also to study theology. In 1907 he gained two first class honours and two seconds and so passed his first medicalÂ proficiency examÂ “with distinction”. He became ill at Edinburgh, with psthisis or TB, and was shipped home not expected to live.Â However, he rallied and recovered, and went on to complete his studiesÂ at Otago University, staying at Knox College while he did so. When war broke out he became a Captain of the 6th Mounted Field Ambulance. After the war, in 1919, he married Mary Frances Tolme at New Plymouth. Gordon had established himself as a doctorÂ at Taihape and this was to be the couple’s homeÂ until the late-1940s. They had two sons: Ronald born in 1920 andÂ Douglas born in 1922. After a period at Takapuna, around the early 1950s, the MacDiarmids decided to retire to Piha, Gordon had had a heart attack and for his health’s sake, the MacDiarmids were looking for a peaceful retirement.Â The property they chose was atÂ 33 Beach Valley Road. On a slight knoll, above Beach Valley Road, the MacDiarmids had a lovely view towards Taitomo Island and The Gap. 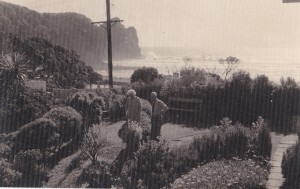 A garden was established around the house and the MacDiarmidsÂ often went for long walks in the parkland surrounding Piha. But this was to be no quiet retirement. With no resident doctor, no paramedics and no rescue helicopter, and miles from the nearest medical help, Gordon became Piha’s “on call” doctor. Helen Pearce remembers taking her son Bevan Watson down the hill to Dr MacDiarmid for treatment after Bevan climbed up on a chair and put his hand on the hot stove element. Dr MacDiarmid treated the hand, wrapped it up and put a large plastic bag over it. “She was such a little thing and she was crying and nervous,” Shirley remembers. “He was so lovely and kind to her. Rodger Curtice recalls that during the 50s and 60s, when the new sport of surfing arrived, with big heavy boards and no leg ropes, surf club members regularly smashed themselves on others’ boards. He recalls having his head stitched by Dr MacDiarmid at least twice, the second time without the help of a local anaesthetic. Athole Murray and Peter Heffernan, he said, and virtually all the members of that era, had treatmentÂ from Dr MacDiarmid. Curtice vividlyÂ remembers Dr MacDiarmid’s role inÂ a drowning incident at the beach,Â when a man was pulled out of the water on the north side of Lion Rock and was put on the Eve Rocker on the beach. This was a device like a see-saw where the patient was laid along its length and then rocked up and down, the idea being to restart breathing. Dr MacDiarmid was called andÂ with a powerful stabÂ thrust a giant needle through the man’s chest into his heart. It contained epinephrine (adrenaline)Â and was designed to shock the heart into action, but in this case, the man was beyond help. The young lifesavers, only teenagers at the time,Â remember these dramatic incidents vividly. Another veteran lifeguard, Brian Webber, relates a similar experience. Despite his desire to to retire, Dr MacDiarmid ran classes for surf club lifesavers in resuscitation methods, passing on his emergency medicine skills, perhaps hoping thatÂ this wouldÂ reduce the role he was playing. 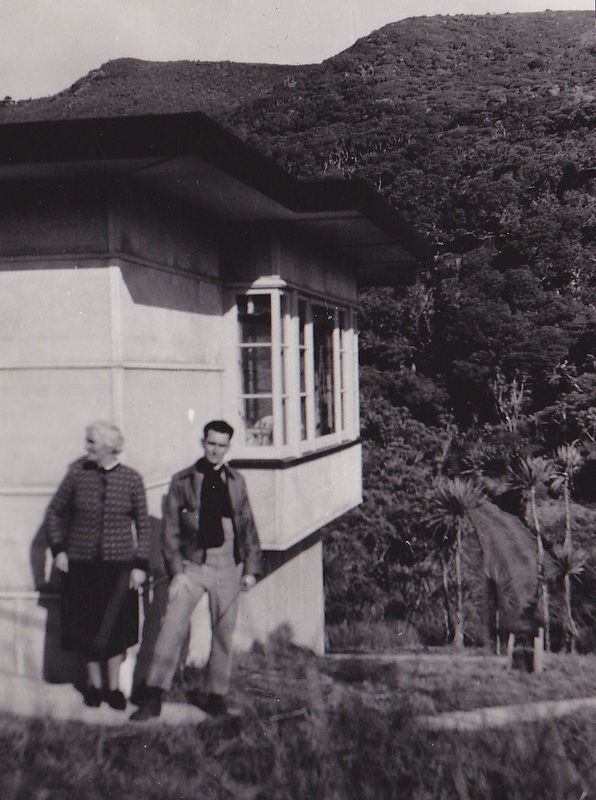 ClearlyÂ Piha was not quiet enough, and around 1969, the MacDiarmids returned to live on the North Shore. 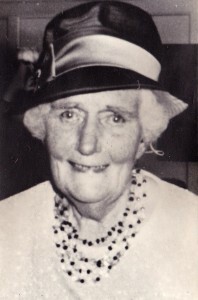 Mary died in 1975 and Gordon on the 17 July 1980, aged 91. 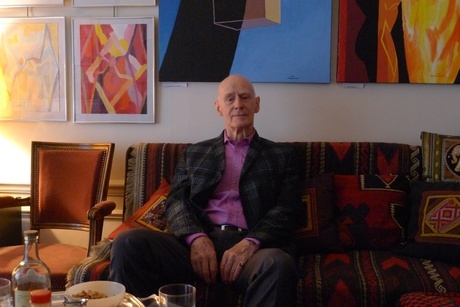 The MacDiarmids’ son, Douglas (left), is a painter of significant note, based in Paris since the late 1940s. His work is represented in many public collections throughout New Zealand. Douglas wrote the piece below, about his memories of his parents’ time at Piha and has kindly given permission to publish it. This piece is copyright. “Leaning back perilously over a good seventy years to rake about in my youth is chancy if you like . Not only have I a congenitalÂ unease with numbers, but an effort to pack more intense living than will go into a limited span of time promises well for distortion. The sea journey back from Europe to NZ in 1949 gave my father time to be on his feet & fairly wellÂ after his coronary thrombosis which had triggered off my sudden return. He was never a colossus, but had the life-long resilience of certain men of slighter frame. 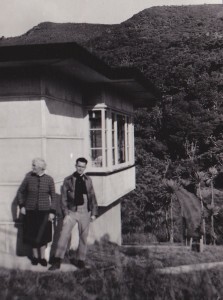 He had begun mulling over buying a small house at Piha beach, thinking the beauty of the site could anchor me there awhile, which was a manifestly unfeasible plan considering my professional dependence on a city centre.Â My mother, however, rapidly saw the advantages of getting her husband away fromÂ pressures that had nearly killed him, & out & away to a paradise & new life for both in retirement at last. It was typical of her indomitable courage as, at the onset of age, for the first time she would have no housekeeper living in. Courage at that degree just canâ€™t fail, & the Piha years were the happiest in the lives of this couple, admirably united come-hell-or-high-water. This must not be taken to mean that all was blissful repose & indolence.Â It was their custom in the afternoon to take long walks in virtually virgin bush stretching inland from the beach.Â For them,Â it provided inspiration as near divine as could be wished, short of taking that invisible step which leads wherever it may. Others were doing their damnedest to beat them to it, inÂ huge numbers, by means of broken bottles in the sand, or, if water was preferred, simply by head-on collision with a fast boat,Â some even compromised by entangling themselves in cables & spoiling some water-skierâ€™sÂ stunt. Â How Â poor souls remaining in Auckland in summer whiled away the time is anybodyâ€™s guess. On returning from walks, it says a lot for my parentsâ€™ nervous stamina, Â since instead of passing out at the sight of spread-out bodies & bones reddening their carefully tended lawn, they would set about one more improvisation of an emergency centre, following whichÂ my mother had the heavy chore of bloody blankets to wash.
My father made countless appeals for medical assistance from Â Auckland authorities, also the urgent needÂ for beach control duringÂ the summer influx.Â I doubt that Â relief was fast in effect,Â & while he laboured alone, he told me that even as a young man heâ€™d never been worked so hard. AdieuÂ Â Piha.Â Â Â Â Â Â Â Â Â Â Â Â Â Â Â Â Â Â Â Â Â Â Â Â Â Â Â Â Â Â Â Â Â Douglas MacDiarmid.Â Â Â Â ParisÂ 2013.